WATKINS GLEN—Tea Party members, interested people, and candidates gathered Saturday, Oct. 2, for the Rally in the Glen. Tea Party groups from different parts of New York attended, including Penn Yan, Corning, Rochester, Ithaca, and Syracuse. The Rally in the Glen was organized by the Odessa Tea Party. Bill Card, Odessa Tea Party member, said the rally was created to bring the area groups together. He added the Odessa group hopes to make this an annual event. There were about 450 people present. “We’re all fighting the same cause,” said Card. He explained the Odessa group was started over a year ago, with concerned people just sitting around the table. This is also how the Finger Lakes Tea Party group out of Yates County started. Founding member of that group, Sandy King, was also present at the rally. Now there are about 140 members in the Odessa group, with meetings twice a month. The group was formed under the direction of the Robert Schulz Foundation. 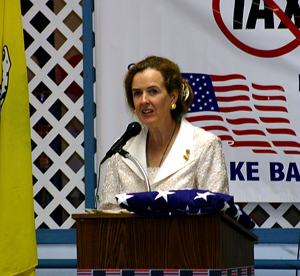 The Liberty Bus and its founder, Beth Powers, was also a speaker. Liberty in America was started as a non-profit organization to encourage people to participate in private charity as opposed to government social programs. The group also wants limited government. Also present were Tom Reed, Jim Hare, and Chris Friend. Local candidates Angie Franzese and Karen Radenberg attended as well. Both are running for Schuyler County Legislature. Franzese is on the Conservative ballot and Radenberg is independent. Franzese said all candidates were invited to attend.